TEATRO EXPEDICION DE FILIPINAS presents THE HUNCHBACK OF NOTRE-DAME (The Musical) RELOADED. This original stage adaptation is written and directed by ALIW AWARDS 2008 BEST ACTOR, JOEY PARAS. Critically acclaimed actor Joey Paras of LAST SUPPER NUMBER 3 (CINEMALAYA CINCO`s BEST FILM, MTRCB AWARDS` BEST COMEDY FILM and AMSTERDAM FILM FESTIVAL VAN GOGH AWARDS' Special Jury Prize for Originality) is Teatro Expedicion's Founder and Artistic Director. As a captain of his ship, he brings us this most remarkable novel of Victor Hugo onstage to celebrate world literature and arts in the metro. THE HUNCHBACK OF NOTRE-DAME (The Musical) RELOADED stars veteran actor BODJIE PASCUA of BATIBOT as Claude Frollo, ramp model LEO PONSECA as QUASIMODO, VIVA ENTERTAINMENT TALENT ANNA LUNA of “EMIR” as ESMERALDA. GMA 7`s SOP STAG, JOJO RIGUERRA as Captain Phoebus de Chateaupers, Internationally acclaimed BEST ACTOR, Nathan Lopez of "ANG PAGDADALAGA NI MAXIMO OLIVEROS” as Jehan Frollo, his twin-brother GAMMY LOPEZ of “PISAY” as Clopin Trouillefou and CHESKO RODRIGUEZ of “ARE YOU THE NEXT BIG STAR?” as Pierre Gringoire among others. 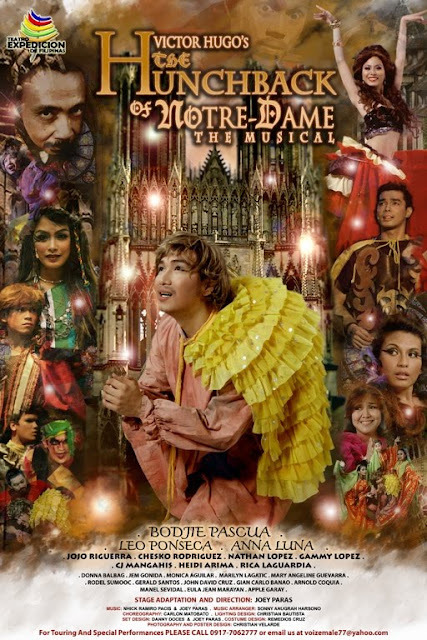 With original music by UNIVERSAL STUDIO`s Songwriter NICK RAMIRO PACIS and JOEY PARAS; and music arrangement by Indonesian Musician, Sonny Anugrah Harsono, this musical will bring you the finest and most faithful approach to Hugo`s immortal story of Notre-Dame`s bellringer and his immaculate love for a gypsy dancer Esmeralda. PHILSTAGE GAWADBUHAY 2010 Best Choreographer, CARLON MATOBATO gives life to its upbeat songs in his creative choreography and theatrical movements. With CHRISTIAN BAUTISTA as LIGHTING DESIGNER, REMEDIOS CRUZ as COSTUME DESIGNER and JOSEPH PARAS as SET DESIGNER, this triumphant musical production will surely awe you with delight! Come and see the HUNCHBACK OF NOTRE-DAME this August 14, 2010 (4PM) at SM CENTERPOINT Sta. Mesa, Manila and on August 28, 2010 (11am, 2PM, 4PM) at SM FAIRVIEW. Ticket Price is P250.00 ONLY! For ticket reservation, please sms/call MR. JOJO RIGUERRA at +63 917 9244914, Miss AA FERNANDEZ at + 63 927 9793123 and Mr. Joey Paras at +63 917 7062777.